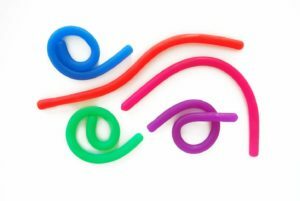 Impresa Products 5-Pack of Stretchy String Fidget / Sensory Toys is now available at Amazon.com for just $9.99 (REG $19.99) (As of 11 February 2019, 11:04 PST – Details) with $10.00 (50%) Savings. Perfect for the classroom, home or office, they’re great for parents, teachers, students, therapists and anyone else. 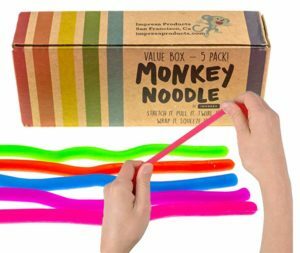 5-pack, COLORS MAY VARY. Each unit is 12 inches long and stretches up to 8 feet! 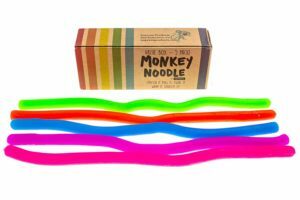 Whether in search of a new fidget toy or tactile / sensory toy, our Monkey Noodles are perfect. Stretch, pull, twirl, wrap and squeeze them – then watch them bounce back to their original shape! They’re perfect for sensory and tactile stimulation. Made with high-quality custom formulated materials, they are hypoallergenic, nontoxic, and free of BPAs, phthalates and latex. 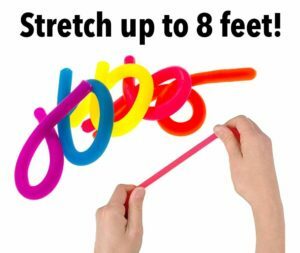 Our stretchy strings are strong, durable and safe for kids and adults alike. Perfect for the classroom, home or office, they’re great for parents, teachers, students, therapists and anyone else. 5 Pack, colors will vary. Each unit is 12 inches long and stretches up to 8 feet! 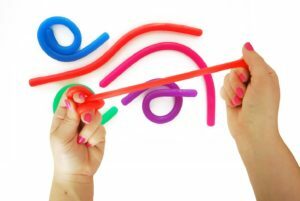 Fidget and sensory toys are great for all children and adults, but especially those with ADD/ADHD, OCD, autism, or high anxiety levels. These toys help promote a sense of calm, reduce stress / anxiety and can increase focus / attention. Suitable for ages 3+. Great addition to a collection of fidget toys/items, including squishy balls, tangle toys, rings, jewelry, necklaces, twiddle toys, and pencil toppers. Note: Do not wrap around neck or use to restrict blood flow.